How to prevent breakdowns and downtime by testing the transformer oil? GlobeCore / How to prevent breakdowns and downtime by testing the transformer oil? Before oil enters transformers, it is tested, filtered and purified. Appearance of solid particles, gases, including oxygen, and moisture in the oil accelerates aging of oil under the stress of transformer operation. To maintain quality, purity and reliability of transformer oil, the oil is regularly tested according to local and international standards. The sample is taken from the lower part of the transformer or storage tank. In any case, the drain opening must first be rinsed with clean oil. The vessel where the sample is placed must be dry, clean and air-tight. 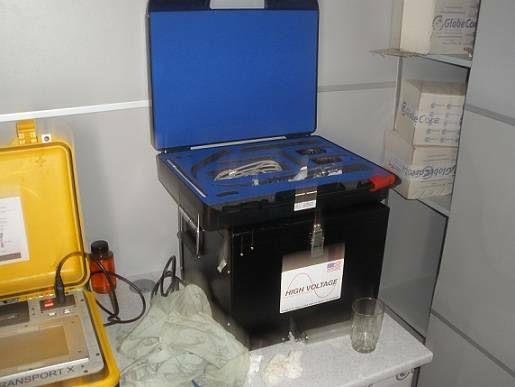 The volume and schedule of oil testing depends on the equipment where the oil is used. Is should be noted that such schedule and quantity of transformer oil tested must comply with regulations. A mix of several oil brands may also be unpredictable. They are also checked for stability in the proportions of the blend, and the stability of the mix must exceed the stability of the component with the least stability. One of the ways of transformer oil testing before use is an abbreviated collection of trials. It includes calculation of minimal dielectric strength, qualitative estimation of solid particle content, determination of acid number, water extract test or quantitative analysis of water soluble acids and flashpoint measurement. The main property of the oil is its dielectric strength. Practice shows that the varying results of this test is determined largely by contamination of the oil by solids, suspended in the oil or settled on the surfaces of the transformer. This type of contamination is the result of destruction of paint and cellulose insulation, and increase the dissipation factor. A minimal breakthrough voltage is measures by various similar systems with standard discharger, which contains of two 8 mm electrodes at the distance of 2.5 mm. Before the oil is tested, the vessel is inverted to avoid formation of air bubbles in the oil. The ceramic vessel where oil is located, are rinsed three times with the oil from the sample. The oil is carefully poured into the vessel’s wall. After every rinsing the oil is entirely drained. A spark occurs between the electrodes at breakthrough voltage. Total number of breakthroughs in a standard test is 6 with 10 minute intervals. The gap between the electrodes should be cleaned to remove particles of carbon. To avoid air bubble formation, the oil is settled; both before the test and between every run. The last five breakthroughs are averaged to calculate the breakthrough voltage. The dielectric properties of the oil is not sufficient for total analysis of its quality, however. Other chemical properties, flashpoint and setting point, acid number, moisture and gas content etc also need to be measured in laboratory conditions. The results offer a complete picture of the performance and condition of the transformer oil, its reliability and viability of use as a dielectric liquid. If oil does not pass the quality test and contains substances hazardous for transformers, the oil is purified and regenerated. The modern filtration and adsorption methods save used oil, the transformer, and also the money of transformer operator.